Her hand dipped into the icy cold Atlantic. By reflex, she raised her arms above the surface, as the seawater rose higher up her legs—a form of escape, of avoiding—stupid, she thought, still not letting go, after all that has happened. Her searching feet found the rocks that tried to trip her; had she not snatched up her track shoes at the last moment, the barnacles would have ripped her bare soles raw. The irritant sand between toes fell subordinate to the Atlantic cold. The water licked her stomach, an invasion of modesty of her own choosing. 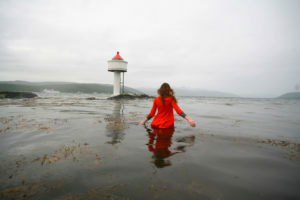 The tide now surged between the soon-to-be-submerged rock islets, swinging her wet shift to one side, making the fabric cling form-fitting on the other. Slow and careful stepping brought her closer to the small lighthouse. If he were there, she would survive this. The edifice of his will would be enough. And if the lighthouse lay empty, then at least she would be safe. For now. Unless her father found a boat. Garth Pettersen is a Canadian writer whose stories have been published or accepted for publication in Queen Anne’s Revenge, The Opening Line Literary ‘Zine, Dark Gothic Resurrected Magazine, and in anthologies published by Main Street Rag, Zimbell House, and Horrified Press. Read his blogs on writing at www.garthpettersen.com or follow him on twitter @garpet011.